Super easy to get into. From the first paragraph, I was drawn straight into Phryne Fisher's world. The writing is wonderful and made the book feel more real to me than my actual life! "Dot supplied herself, Jane, Ruth and Tinker with cocoa and a few biscuits to guard against night starvation." I can relate to people that aren't happy until they have planned when and what their next meal will be. "Madame Sélavy was tall, thin and haggard. Her face was bony, her nose beaky, her eyes as bright as pins. She was heavily made-up, white paint and red lips and kohl around the eyes. She wore a draped gown which Princess Eugenie might have considered overdecorated, dripping with black and gold bugle beads, embroideries, tassels and fringes to the utmost tolerance of woven cloth. She smelt strongly of patchouli. Rings burdened every finger, her neck was wrapped in pearl-studded chains and a band of brilliants encircled her throat. " The main mystery was solved by an unlikely coincidence. I can forgive this because there was some decent investigating up to that point and Phryne did solve one of the sub-mysteries. That was enough to keep me happy so I'm not too bothered about the coincidence that was thrown in there. There are a few loose ends that I can't work out. I'm not entirely sure what the point of the treasure hunt was, or what the bit in the cave near the end was about. (view spoiler)[ If people had been searching for the treasure for so long wouldn't they already have found that? Phryne didn't do anything special to get there, it was just a cave on a beach. (hide spoiler)] And when the two men tried to abduct Phryne, who was watching from the neighbour's house and why? Everything else about the book I loved. 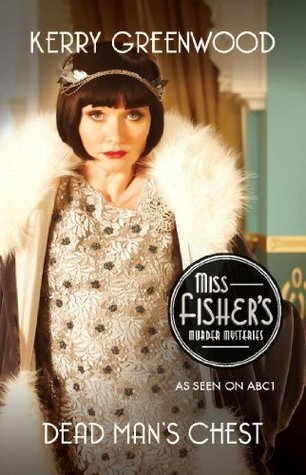 I've read two in the series now and Phryne Fisher is already one of my favourite book characters. You've got to admire a woman that will quite happily abandon her clothes if it helps her escape the grasp of an attacker. Sign into Goodreads to see if any of your friends have read Dead Man's Chest.